It's Halloween, and while most people are thinking about treats, Dr. Hare is thinking about how to trick the world into submitting to his fuzzy-fisted rule. Here is, once again in a new city. Where do you think he is this time? Congratulations to the first 10 finishers of Game Show Island! 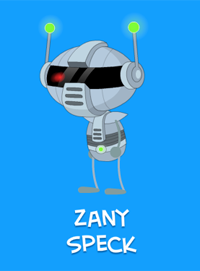 Many Poptropicans have already defeated the robots at their own game (shows), and made Poptropica safe for humans again. As we usually do, we want to take a minute to recognize the first 10 players to complete Game Show Island -- starting with a familiar face in the first spot. Congratulations to all the winners so far, and to those yet to come! 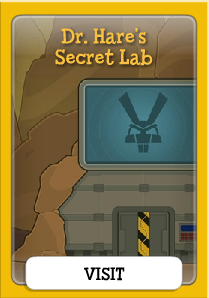 Attention Poptropicans: The Dr. Hare's Secret Lab mini-quest is now free in the Poptropica Store. Wait -- is that a typo? We're GIVING this exciting adventure away? Once I'm back from my travels, I'll be sure to have some words with the other Creators about this. 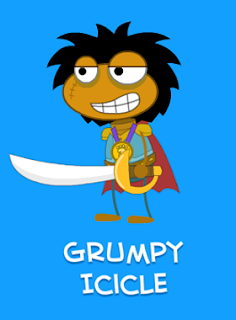 There's entirely too much merriment around Poptropica these days! 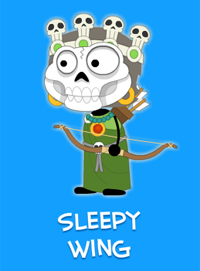 Poptropica Members have exclusive Early Access to the full adventure. Non-members can try out a limited portion for free. Visit Poptropica to start playing Game Show Island! Game Show Island launches tomorrow! You can count it down to the second on the Poptropica homepage. Game Show Island will be fully playable to Poptropica Members. Non-members will be able to try out a limited portion. 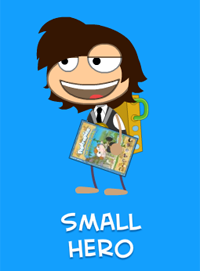 But wait -- there's even MORE great Poptropica stuff to announce! On our new info page, we've got all kinds of new information about Legendary Swords, including its release date: 11/11/11. Not only does this page have news about the game, it's also got desktop themes you can download. There's always more to look forward to with Poptropica. 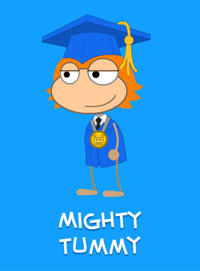 Keep checking this blog for all the latest Poptropica announcements! There are still two days to wait until Game Show Island becomes available. 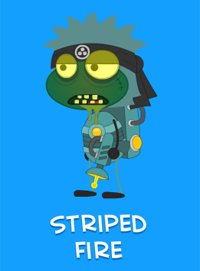 But if you're a Poptropica Member, you can get a taste of the robot revolution right now in the Poptropica Store. 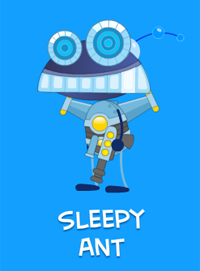 The Game Show Robot is available now for Poptropica Members. As with every costume and Gold Card in the store, Members can use this costume for as long as their Membership is active. What are you waiting for? Find out how to become a Member today! Time is running out to claim the first scavenger hunt prize! 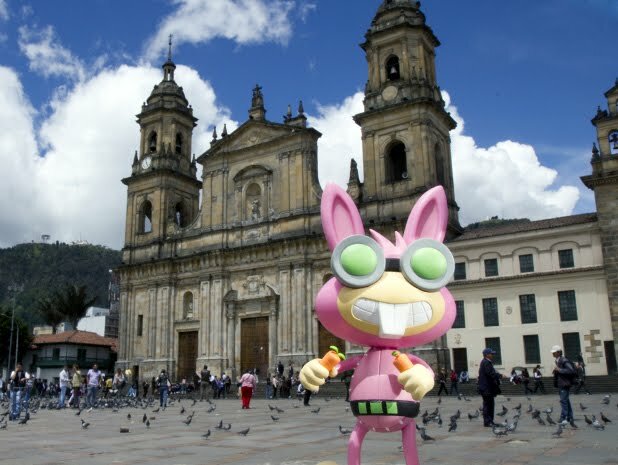 Just a friendly reminder: if you haven't yet found the answers to our first Poptropica guidebook scavenger hunt, time is running out! The first scavenger hunt will be open until until Wednesday, October 26. After that, the code won't work and you won't be able to claim the prize. For more details about our scavenger hunt, click here. 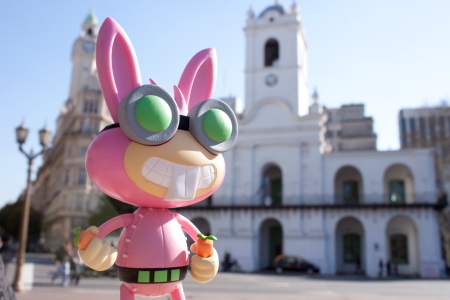 To celebrate the launch of Poptropica: The Official Guide, we threw a little shindig. Imagine having a Poptropica spread like this at your own party! That's right, we made a Poptropica cake. Here's a closer look. Of course, every day is a party when you play Poptropica! The Poptropica Inflatable Blimp keeps getting more fans. Here, the bestselling author of Diary of a Wimpy Kid (and Poptropica creator!) Jeff Kinney takes his for a spin. Okay, the blimp is pretty awesome on its own. But it also comes with a code that you can use to play the exclusive Blimp Adventure! The Poptropica Inflatable Blimp is only available at Toys 'R' Us. Get yours today! A lot of you have been wondering when Game Show Island would be coming, and now we can tell you. Game Show Island will be available to Poptropica Members beginning on Thursday, October 27. Visit the Poptropica homepage to count down the seconds! And keep visiting this blog for all the latest news about Game Show Island. Eagle-eyed Poptropicans may have noticed some familiar items in the freight car on Mystery Train. 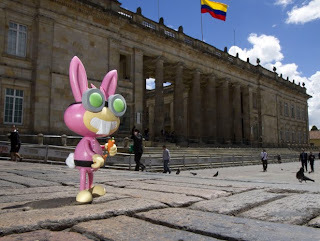 It seems that the World's Fair organizers brought along a lot of items from other Poptropica Islands! Can you look at this picture of the freight car and guess which Islands the numbered objects came from? Click the image to see the full-sized version. We'll give you the weekend to puzzle over it. Then we'll post the answers next week. In the meantime, if you haven't had a chance to take a ride on the Mystery Train yet, visit Poptropica now to play! Mystery Train is open to all. Poptropica: The Official Guide book and scavenger hunt are now available! At last, our first book is here! 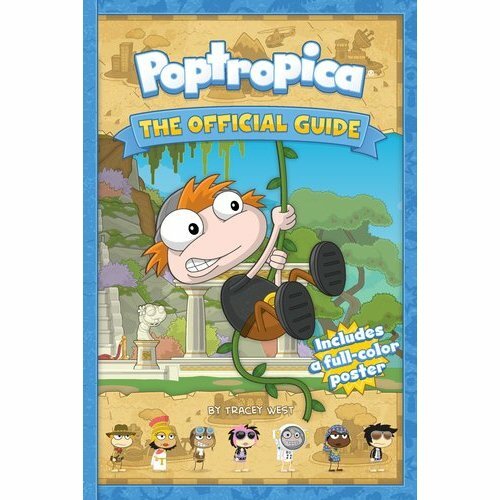 Poptropica: The Official Guide is available today. You can find it at Amazon.com, or in bookstores everywhere. Today is also the first day of our book scavenger hunt! Visit our official book page to get your first clue. Find the answer in the pages of your book, then log onto your Poptropica account and enter the answer in the code field to claim your prize! Enter the answer in the bottom righthand corner of your Welcome Back page. This code will only work for a limited time. 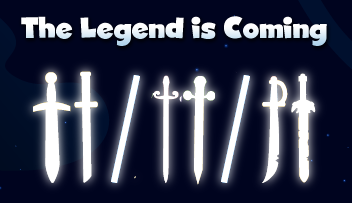 There will be a new clue every two weeks through November, so keep checking back! Very few players can make it to the top of the Money Ladder without help. That's why Poptropica Members can call on three experts for help while playing the game. The Starlet is most knowledgeable about pop culture: music, movies, and the world of Poptropica. The Professor is the one to ask about factual subjects like history and language. The Athlete, of course, knows the most about sports. Each one has a specialty, so make sure you choose the right expert for the job. Choose the wrong expert for the topic, and they're likely to get it wrong. With the help of the experts, maybe you too can make it to the top of the Money Ladder! Dr. Hare is on the move again. Where do you think he is this time? We'll have the answer for you in a few days, on our interactive map. The wait is over. Everyone can now play the entire Mystery Train quest on Poptropica! Visit Poptropica now to play Mystery Train! Look what floated into our office! 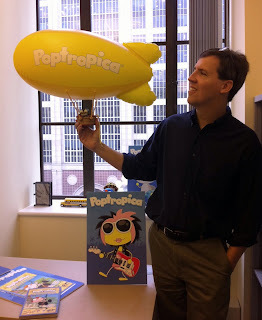 That's right, it's the one and only inflatable Poptropica blimp! 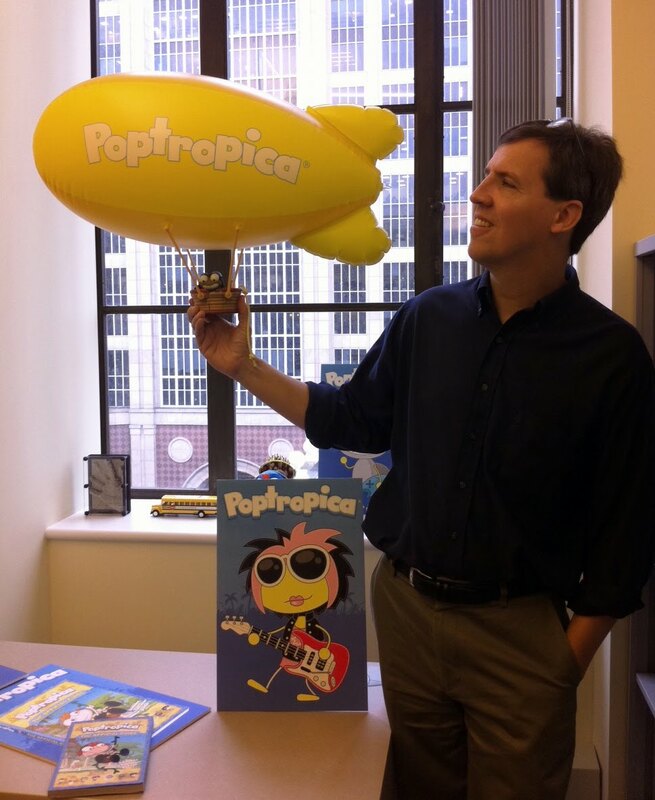 The Poptropica blimp will be available in Toys R Us stores any day now. Besides coming with a navigator, whose costume can be swapped with the other 3" figures, it also comes with a code that you can redeem on Poptropica to play an exclusive new adventure! How cool is that? It's Halloween season, and that means it's the perfect time to replay Great Pumpkin Island. But say you've already played through Great Pumpkin Island once. You could always create a new Poptropican to play it again. Or, you could use the Island Restart feature to play it with your current Poptropican! Here's how to do it. First, go to your travelmap and visit Great Pumpkin Island. Next, open the Great Pumpkin Island map. Click on the "Restart Island" button. Confirm that you want to restart. All of your quest items will be removed from your inventory. Abracadabra! You're back on Main Street, in the daytime, ready to start the quest all over again. Don't worry, you don't lose your Island Medallion. Your stats page will even keep track of how many times you've completed each Island, so you can go back again and again. 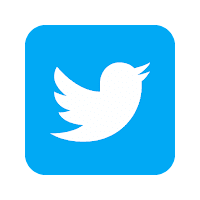 Island Restart works with any Poptropica Island. Happy restarting!